GRAND HAVEN, MICH., FEB. 23, 2016―After traveling 1,921 miles from her home town in San Pedro Sula, Honduras to Grand Haven, Michigan 25 year old Joy Gonzalez was recently fitted with specialty hearing aids that she only dreamed about since childhood, thanks to Casa de Esperanza, a Grand Haven-based charitable organization. Casa de Esperanza was founded in 2004 by local dentist Dr. Bill DeWitt and his wife Lori DeWitt, R.N., of Grand Haven. It is a faith-based ministry serving the people of Honduras. 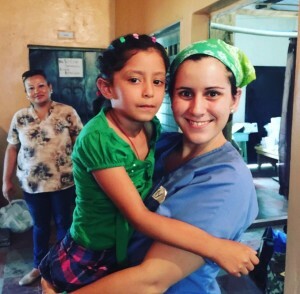 Over the past 12 years, the organization has served 8,000 patients with free dental and medical care clinics, distributed over 7,200 Bibles and provided 6,000 volunteer hours to those in need in the Central American country with a population of 8 million. Casa de Esperanza provides a three-pronged approach in its ministry: dental and medical care, youth education and construction. Joy Gonzalez has known the DeWitt family for 15 years, serving as an interpreter when Bill and Lori DeWitt, along with area volunteers travel on their annual “brigades” or mission trips to Honduras. “On February 12th I was fitted with my new hearing aids and everything is a new sound and new experience for me. I listen really different now and it is a little bit difficult to adapt but I am trying to do my best,” said Gonzalez. The DeWitt’s son, Dr. Scott DeWitt, an audiologist, was able to assist and provide valuable support in this special process for Joy. Pedro Sula, Honduras. Currently, she is studying towards an M.A. in finance there and hopes to develop a foundation to help others who have hearing issues. As a means of understanding her teachers during elementary, junior high and high school years in Honduras, Gonzalez learned to read lips in both English and Spanish languages. She was fitted two previous times in her native country at ages 10 and 13 with hearing aids but neither pair worked, resulting in years of frustration at school. “I remember in third grade one teacher said I could not remain in class because she did not have time to teach me. I didn’t understand this because I always had this problem in my life. I changed school and my mom told me to save for my next hearing aids and I didn’t hear any better with them,” said Gonzalez. Upon meeting Lori and Bill DeWitt at age 17, Gonzalez found the help and support she needed and the rest is history. In 2007, local Muskegon physician Dr. Dan Fox fit Gonzalez with her first “American” pair of hearing aids and he opened the door for her current fitting. “I think Casa de Esperanza is amazing. I’m happy with what they do for the people of Honduras because they help people get an education and I know how hard they work. I feel like I grew up with the help of Casa de Esperanza and now I want to help people just like me as my way of giving back for all the blessings I received,” said Gonzalez. In general, the DeWitt’s have discovered from their 12 years of travel to Honduras that people who have significant hearing loss like Joy Gonzalez have to adapt by learning sign language. Many receive “generic” hearing aids that do not offer the maximum support required. Coupled with that is the fact there is no support to help them maintain their hearing aids from normal wear and tear. During her time in Grand Haven before departing on March 1 for her hometown in Honduras, Gonzalez has had time to experience local west Michigan culture. “I like the people here and the snow. It is really calm, quiet and there isn’t the stress like I experience back home in San Pedro Sula. I have been shopping, doing lots of cooking and painting,” said Gonzalez, who seems like a family member in the DeWitt household. Casa de Esperanza has ties with several area churches, including: First Reformed Church of Grand Haven, First Presbyterian Church of Grand Haven, All Shores Wesleyan Church of Spring Lake, Christ Memorial of Holland, Newhall Community Reformed Church of Wyoming and Unity Reformed Church of Norton Shores. “Our next brigade to Honduras will be in February 2017 and Joy will be with us again serving as an interpreter for our patients. Anyone is welcome to join us who is over the age of 18 or―for those younger than 18―they need to be accompanied by a parent. They also need to be willing to do volunteer work, can get along well with others and be a team player,” said Lori DeWitt. “Our goal is to bring hope to people in need throughout Honduras. We promote self-sufficiency and spiritual growth through Christian-based supportive housing, training and skill development,” said Bill DeWitt.